Consumers reguarly replace their devices with newer ones as mobile computing device OEMs frequently upgrade their products by integrating advanced features. Hence, devices such as smartphones and tablets have shorter replacement cycles. Also, strong competition in the smartphone market has led to continuous technological developments and increased product launches within a short period. For instance, Apple (News - Alert) launches new and improved smartphones every year so that their customers can replace their old smartphones with the latest ones. The increase in the product replacement cycles of mobile computing devices such as smartphones and tablets is expected to increase the demand for mixed-signal SoCs. "APAC will see a faster growth during the forecast period. There are many OEMs of consumer electronic devices, automobiles, telecommunication equipment, and enterprise networking equipment in the region. Countries such as India, China, Indonesia, and the Philippines are generating a huge demand for smartphones. In the Americas, many automotive OEMs are investing heavily in autonomous vehicles. Autonomous vehicles are equipped with advanced sensors and electronic components. Also, the development of the telecommunication network in the region is facilitating a smooth transition from 3G/4G to 5G. 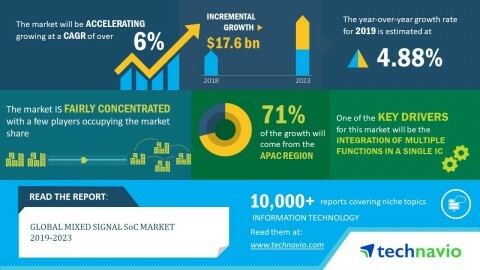 Many such factors will collectively contribute to the growth of the global mixed-signal SoC market", says an analyst at Technavio. Companies such as Huawei (News - Alert) Technologies, Nokia, ZTE, and SK TELECOM are heavily investing in the development of telecommunication network infrastructure globally. For instance, the three South Korean telecommunications companies SK TELEKOM, KT (News - Alert), and LG Uplus recently announced the launch of 5G services in South Korea. In October 2018, Huawei Technologies received the approval for conducting 5G field trials in India by the Department of Telecommunications of the Ministry of Communications, the Government of India. Many such developments among vendors are expected to boost the global mixed-signal SoC market during the forecast period. MediaTek (News - Alert) Inc.